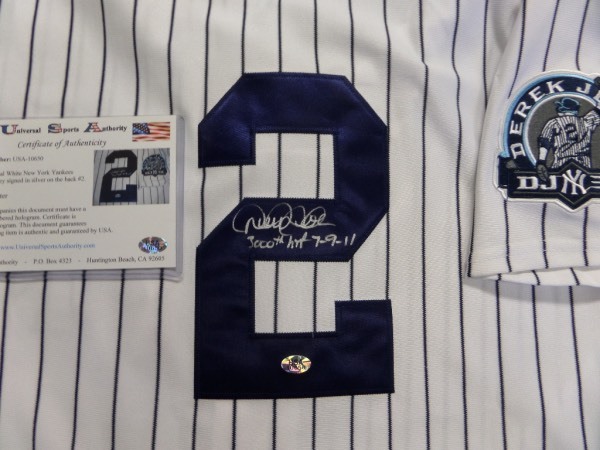 Coach's Corner - Derek Jeter hand signed/certified "Special" Yankees jersey. Go Back to Lot List Derek Jeter hand signed/certified "Special" Yankees jersey. This almost too easy future Cooperstown HOF investment jersey is a Majestic game model, tagged right, and with sewn on everything including the "DJ3K" patch on the sleeve. It comes back #2 signed by Jeter in stunning silver paint pen, grade all over is a 10, and show off on the USA guaranteed piece is easy from 35 feet away. It is a $1000.00 buy and hold investment, and in a star getting inducted next year.